Municipal e-services: can social media help? Local authorities may be overlooking the power of social media to deliver new e-services, not just promote them. 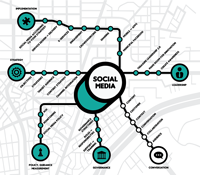 Social media offer unprecedented opportunities for municipalities to connect with citizens and firm connections open the way to user-centric service design and delivery. Throughout the first decade of the 21st century, governments across Europe have embraced the online world. The Internet and the Web have transformed how they do business and deliver services to citizens. From passport applications to car licences, reporting potholes to paying tax, citizens now expect e-services to do it all with just a few taps on a screen. But since the development of early e-services, Web 2.0 has reset the field. Now citizens expect more interactivity, easy mobile access and full integration with apps and social media. Don’t fall into thinking that social media platforms are just extra channels for marketing and communication. Far more than this, they have become essential for keeping many citizens connected – with family and friends, with global news, and with everyday life. The best way to reach many people these days is through social media. Moreover, citizens expect us to keep up with them and be available 24/7. Social media help us to be present in some way even after office hours. Of course, citizens can’t expect to pay fines or taxes via Twitter, but social media should definitely have a place in your service delivery. Alternative inbox – businesses still use email, but personal communication is more often via Facebook, Twitter and other social networking platforms. Do you have the facility to message individuals and groups in different ways? Jenny Broden is a Project Manager for the Municipality of Karlstad in Sweden. How can social media channels be integrated into your organisation’s customer services? People want to be able to contact their council as fast and efficiently as possible. Groningen in the Netherlands lets them use Facebook and Twitter. A survey of residents in Groningen about their use of social media revealed that a majority of citizens logged into social media (mainly Facebook and Twitter) on a regular basis. People said it would be helpful if they could contact the municipality through these channels too. As part of a previous North Sea Region project, Groningen had already integrated all its incoming customer enquiries into a single customer contact centre. Staff in the centre deal with requests and questions made by citizens using email, web and the town’s dedicated customer service hotline. Now the municipality needed to add Facebook and Twitter into the mix. Following extensive consultation the town agreed on a management structure and workflows for different types of contact via social media. Using the Obi4Wan webcare and web monitoring tool, the Groningen webcare team screens all social media channels: posts on the Groningen050 Facebook page, the @stadsnieuws and @stadsbeheer050 Twitter accounts and any tweets about the municipality. Web monitoring also reveals what citizens are concerned about in real time, especially regarding service provision or the city’s reputation. This allows the municipality to respond to trending topics without requiring any specific trigger (e.g. a complaint or question from a citizen). Any social media messages that need a response are identified by the webcare team and answered by the customer contact centre (the webcare team is an integral part of the customer contact centre). The policy is simple: every question receives an answer. Customer contact staff deal with each contact as necessary following standard workflows. Officials from the city’s communications department (who work with the same webcare and webmonitoring tool) ensure that all corporate messages go out through all of the appropriate channels. Groningen’s two Twitter handles are used for public messaging: @stadsnieuws for general municipal announcements and @stadsbeheer050 for dealing with reports on potholes, faulty street lights and similar public service and maintenance issues. Eventually these two accounts will be merged together. Customer contact agents are encouraged to ask colleagues for advice whenever they are uncertain about how to respond to social media posts. The municipality’s communications department has been tasked to deal with politically sensitive posts and handle any traffic which cannot be easily answered (i.e. not of an administrative nature). The communications team also has authority to re-tweet or share posts on its own wall. Groningen answered at about 1000 tweets in 2014!